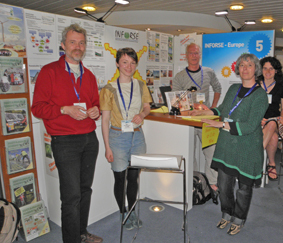 The ENCI LowCarb Project was highlighted in an exhibition at the Green Week 2011 Conference. This annual conference about European environmental policy, this year focused on resource efficiency. To see the website of Green Week, click here. We also displayed energy efficient items such as solar radios, LED light bulbs and a solar helicopter toy. 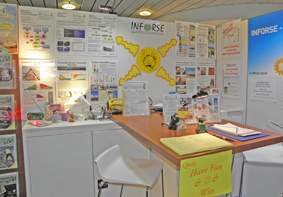 We created quiz to test people's knowledge about energy efficiency, as well as INFORSE-Europe. To take the quiz and find out the answers, press here. 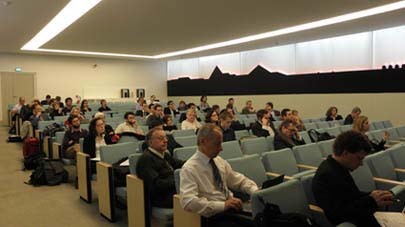 People were very interested to hear about our involvement with the Low Carbon Societies Network and many wanted to know more about the different scenarios and visions this project included. 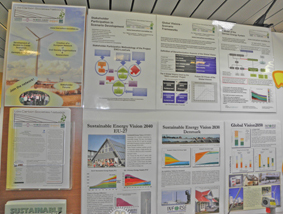 We featured posters about the ENCI LowCarb project and specifically focused on the global visions as outlined by CIRED, stakeholder participation in scenario development and the German energy system model REMIND-D.
Gunnar Boye Olesen, Jens Carsten Hansen, Judit Szoleczky and Kate Stanley. Many people visited the exhibition: People from EU Commission, local authorities, companies, students as well as just interested individuals. Most people came from Belgium, Italy, France and Germany but there were also a few from UK, Denmark, Netherlands, Romania, Hungary and Poland. 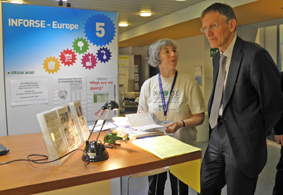 On the photo: Janez Potočnik, the European Commissioner for the Environment, learns about INFORSE and the Low Carbon Societies Network.